The collecting options from 1953 consist of an eclectic mix of cards, including food cards, rookie short prints, tobacco cards, the first card appearances of a legendary veteran, and a few truly iconic cards. While there are plenty of choices for collectors, ten of the top 1953 baseball cards stand above the rest. 1953 was an interesting year for collecting. Topps and Bowman continued their battle for baseball card supremacy after Topps won in federal court the previous year, giving them the right to continue to make trading cards. The battle moved to exclusive contracts with players that limited the other company's ability to make new cards featuring that player. Although the 1953 Topps set was originally planned to be 280 cards, six players had to be eliminated from the checklist because of their exclusive contracts with Bowman. This means cards #253, 261, 267, 268, 271, and 275 were never issued. However, at the time, collectors were not aware of that fact and it must have caused considerable frustration as kids tried to complete their sets. 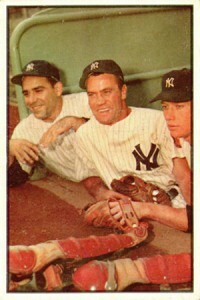 In 1991, Topps reprinted the entire 1953 set. These reprints allow collectors who are interested in having copies of the cards, but don't quite have the budget, the ability to still enjoy the set. Finally matching Topps in the color department, Bowman bested their competition by releasing cards that featured full-color photos of players for the first time. While the 1953 Bowman color set gets most of the headlines, the card maker also issued a separate black-and-white set with a different checklist that features just 64 cards. 1953 also saw the first cards featuring the Milwaukee Braves name after the team moved from Boston. In the Topps set, the first series features the "Boston Braves," but in later series the team name was adjusted to "Milwaukee Braves." 1953 would also be the last year that the team from Cincinnati would simply be called the "Reds." They would change their name to the "Redlegs" until the end of the 1958 season to avoid confusion with the moniker associated with communists. Similar to 1952, 1953 packs in a lot of baseball card options. The following list is largely based on value, but historical significance was also taken into account. It is easy to forget that tobacco cards were still around long after they stopped being packaged in cigarette packs. These oddly shaped cards at 3 1/2" by 4" came in chewing tobacco packages with a bottom tab that could be ripped off and mailed in to receive a baseball hat. 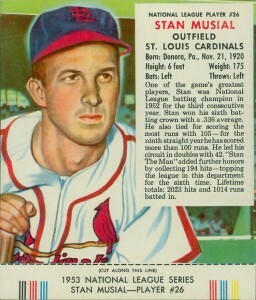 Famously, Stan Musial does not have a card in the 1953 Topps set and this card receives a lot of attention as an alternative to that missing card. 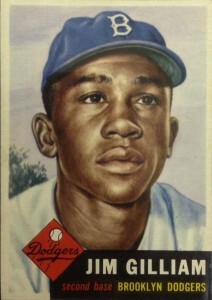 While contemporary collectors may not be too familiar with Jim Gilliam, he was the National League Rookie of the Year in 1953 and played 14 seasons for the Dodgers in both Brooklyn and Los Angeles during his career. The value of Gilliam's 1953 Topps card is a perfect storm for collectors: a rookie card of a prominent player that is also both high-numbered and a short-print card. All this results in a card that can command prices higher than cards from the other Hall of Fame members in the same set. The first of three New York Yankees on the list is probably one of the most universally loved baseball players ever. 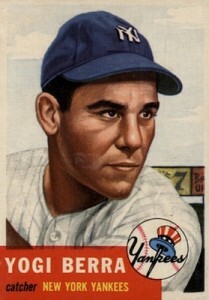 Although Berra's rookie card can be found in the 1948 Bowman set, it is his early Topps cards that command remarkable prices, especially given that the Yankees have one of the largest fan bases in the world. Actual in-game action photography wasn't used until the 1971 Topps set, but 1953 Bowman offers a few amazing examples of what baseball card photography would evolve into. 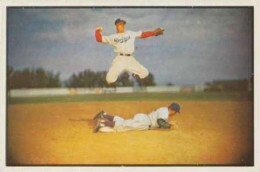 Although it is a staged photograph, Pee Wee Reese's Bowman card is so much more exciting and interesting than the simple portrait cards that dominated trading cards of the day. As Reese jumps over the diving runner trying to make the throw to first base for the double play, you can see the early inspiration for sets like Topps Stadium Club that would use full-bleed photography decades later. 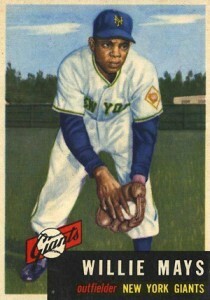 The 1953 Topps set only contains 274 cards. By comparison, 1952 Topps had 407 cards. Not only are the last 60 or so cards, the "high numbers," printed in smaller quantities than the earlier series, some of those high-numbered cards are even further short-printed. This is the case for Willie Mays' #244, making it a case where the supply will never match the demand. 1953 Bowman offered collectors the first chance to see major league players in full-color photos and this gave Bowman a technical advantage over Topps, who again used painted photographs in their set. Bowman was also able to feature exclusive players, including Stan "The Man" Musial, making this card the key 1953 card for Musial collectors. 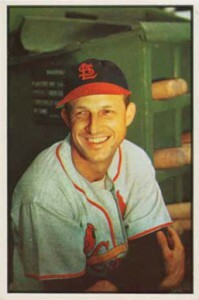 This would be Musial's last regular-issue trading card until 1959, believe it or not. 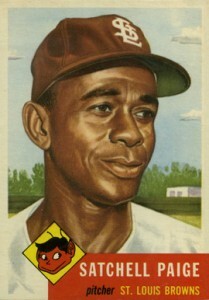 The 1953 Bowman set is noted for its simplistic design with no logos, names, or signature featured on the front. The cards offer simple full-bleed photography and include some of the earliest examples of multi-player cards. Card #44 features not only Yankee legend Mickey Mantle, but also Yogi Berra and Hank Bauer, all in one place, making it one of the most sought-after cards in the set. Topps legendarily placed Andy Pafko as the #1 card of their 1952 set. They raised the ante in the next set and gave Jackie Robinson the first position. This card's value enjoys the same premium as Pafko's #1, as it is difficult to find mint and near-mint copies. Paige's legacy as one of the greatest pitchers of all-time was set long before he was able to pitch in Major League Baseball and even longer before he would have his own baseball card. It was more than 25 years after his debut in 1926 that Paige would be featured on his one and only Topps card. When near-mint copies of this card become available, they can command intimidating prices. As you might has suspected, "The Mick" holds the position as the top card from 1953. After dominating 1952, Mantle is again the big kahuna when it comes to value. 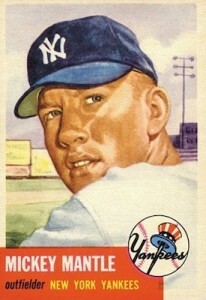 Thankfully for Mantle collectors, his card isn't short printed in 1953 Topps. However, it still dwarfs the values of the other cards on the list. DODGERS PSA LOT: 1953 BOWMAN #145 GEORGE SHUBA PSA 3 & #14 BILLY LOES PSA 4 mc ? Great article as always Matt. I learn something new everyday about baseball cards and I thought I knew quite a bit. Very interesting that Paige’s first and only Topps card is the ’53 Topps despite pitching since 1926. 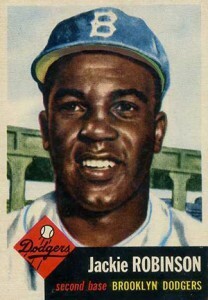 Especially since Jackie Robinson has ’52 Topps. 1953 TOPPS Mickey Mantle SP Short Print #82 SGC GRADED 5.5 Bonus PSA CARD! 1953 Bowman Color Mickey Mantle #59 SGC GRADED 80 6 NY Yankees BEAUTY!